“They turned me down again… They say it ain’t the same anymore… The flair is gone… What is wrong with me? “He murmured to himself, sprawled disheveled on his rocking chair, with wine in one hand and cigar in another. “It seems like ages I created anything worthwhile. Everything I create is rejected. The paintings are too dark? But I used the brightest of all colours. They say that the life is missing. But I have put my life into them. What is wrong then?” he asked his lifeless paintings and unfinished works hanging in the room. Aimlessly, he stared across the room towards the sully easel, then to and fro between his once called master pieces and the now rejected trash. With a glum expression he stood up and went out into the verandah. Cool breeze brought back distant memories, the first time he had come here. “Rivela a me, oh Venezia!” (Reveal unto me, oh Venice!) He wept. 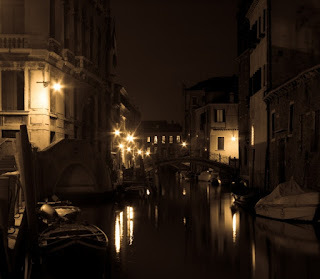 Fate or destiny, whatever it was that had brought him here, into the floating city of Venice, he still was not sure. New city brought him fortune, favor of nobles, fame, prosperity, the beautiful woman he had loved and what not. He was heralded as a new age artist, a painter with the golden touch. The doge himself offered him patronage, what else could have any painter asked for? Not many men have ever had such a steep ascent to fame. His depictions of love, of life, religion, aristocracy, royalty, intimacy never failed to mesmerize. Each detail, every curve and every notch were carefully crafted. He blew life into mere artwork, retouched it with tender care and gave a soul to each one of his creations. His paintings needed no words to explain, and often people fell short of words in praising them. And today, after having seen the pinnacle of his success, he stood alone, in the verandah of his lavish manor facing the glorious city, searching his creativity in whiffs of tobacco smoke and deliriums of wine. “What changed?” he wondered, as his eyes grazed the nightscape of the city. A moonless night, a sleeping city, canals lit with oil lamps, navy ships patrolling the sea in the distance, aroma of the climbers and midnight blossoms mixed with the cool breeze, sculpted draperies faintly visible in the halo of torches. But nothing seemed to have changed. Only that it did not inspire him anymore. About five years ago, he left his homeland village in France in search of favor and a place where his talent would be recognized. He had heard of Venice as a paradise for artists and had been naturally lured towards it. He found flavor, and taste for his work. There had been no turning back, not until now. “il pennello, e non sigari dovrebbero ornare le mani di un artista, mio signore!” (The brush, and not cigars should adorn an artist’s hands, My lord!” a concerned voice seemed to echo from the back of his head. “My husband is troubled, how could I have slept, love” with this she took away his glass of wine and cigar. He did not resist. “What troubles you?” she asked as she rejoined him on the railing of the verandah. “They rejected my work yet again” he said with a broken heart. “They say it’s lifeless. It’s a frustrating experience for me.” he said dejectedly as he crumbled against the railing. I have it in mind, but it will take a bit more time. Voila! !I like it...yet another captivating post from you and that too in parts that makes it even more interesting. It is actually true that when we reach the pinnacle of success,there is no other way to move but to move downwards. A lost painter .... very thoughtful Blasphemous and the character is very well depicted ! probably when there is everything with you that you ever asked for, you realize something went missing...it isn't just a 'block' it is the loosening of spirit and confrontations with self(i believe)...Awesome want to read the next one soon! "The paintings are too dark, But I used the brightest of all colours." i like those lines.. awesomely written!